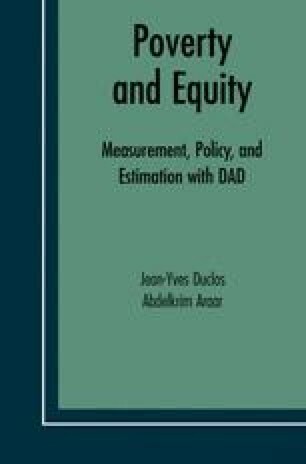 Assessing statistically the extent of poverty and equity in a distribution, or checking for distributive differences, usually involves three steps. First, one formulates hypotheses of interest, such as that the poverty headcount is less than 20%, or that tax equity has increased over time, or that inequality is greater in one country than in another. Second, one computes distributive statistics, weighting observations by their sampling weights and (when appropriate) by a size variable. Third, one uses these statistics to test the hypotheses of interest. This last step can involve testing the hypotheses directly, or building confidence intervals of where we can confidently locate the true population values of interest. This third step may allow for the effects of survey design on the sampling distributions of distributive indices and test statistics, and may also involve performing numerical simulations of such sampling distributions, if the circumstances make it desirable to do so.